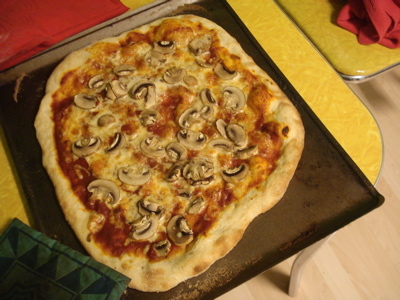 Tonight, I made (and then ate too much) mushroom pizza. I also made some progress on my teal shalom. A few more inches, and I will be good to go. I am still thrilled with the accidentally perfect sizing, and I’m pretty sure this is only going to require three skeins of Cascade 220. We’re getting into the crazy part of the semester — I’m expecting a huge pile of papers to grade tomorrow, and it is time for me to really get a move on with the writing I need to turn in next month, so my posting might be a bit erratic, but I’ll try not to disappear entirely. Spending time in this space makes me happy. This entry was posted in grad school, kitchen, knitting and tagged champ, kitchen, knitting, pizza, ripped jeans, shalom by barefootrooster. Bookmark the permalink. I am so glad that you’re grinning. 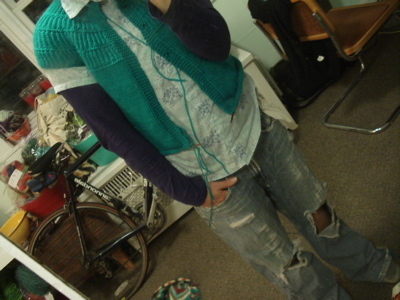 I love those jeans and know exactly what you mean about breathing easier in them. My orange cotton sweatshirt gives me the same feeling, although my family tends to groan or wince when I put it on (I have no idea why.) Also, love the sweater, looks good. The ring you’re wearing looks just like one I have–I’ll have to post a photo so you can compare. Have fun (!) at school and good luck. Those are some perfect post-conference celebratory relaxing jeans. 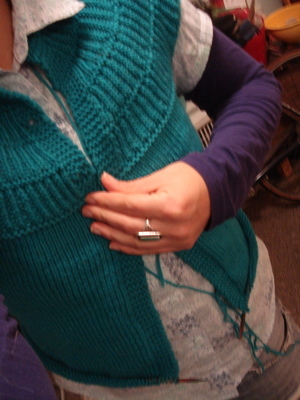 I love how the Shalom is coming together on the fly … and that color is perfect for spring! Pizza is divine. Love those jeans! Congrats on your conference paper & the lovely Shalom progress. Meanwhile, I will be feeling your grading pain as my semester, too, comes to a close. Time to remind myself that I gave these assignments because I truly thought it would make a difference for the students’ learning. Those jeans look so incredibly comfy (they’re cute, too!) – what a treat after giving your paper. And congrats on that too, btw! Shalom looks gorgeous and the fit could not be more perfect! Happy, giddy, comfy….all good words to describe good things. We shall wait and be happy when you have the time to post, and that Shalom sweater is beautiful! That pizza looks mouthwatering! Also, awesome progress on Shalom–not only that, but you’ve managed to complete the conference paper to boot! Congratulations! Good luck with this last leg of the semester! 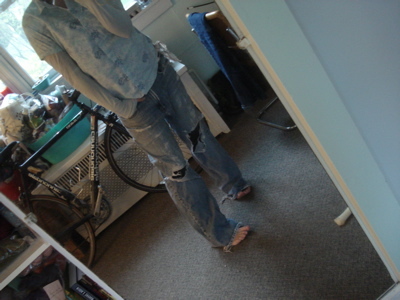 I also love those jeans!!! They look soooooooo comfy!! The shalom is really looking good, inspired me to give it a try ;-) Glad for your giddyness(?) LOL!! Have a wonderful spring and take time to enjoy! I really enjoy your blog. Love the teal! Love the shalom! Nice blog!